How regular exercise and a good diet can radically improve your energy and therefore your ability to create your Perfect Lifestyle. The full chapter on Exercise and Diet will give you motivation and leverage for making positive changes in your life. Making your body healthy, strong and fit has multiple Lifestyle benefits. Finding the time and the motivation is key. Given it is so simple, what keeps most people from being a healthy weight and exercising 3-4 times a week? 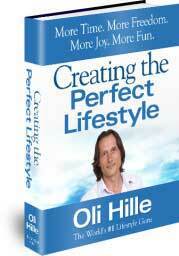 Time is a huge part of what my Lifestyle Book is about. As you cut out of your life the time-wasting activities, and start building your career and other activities around your lifestyle, you will find you have the time for the important activities in life. Prioritizing all of the many activities of modern day life is also a focus of my book. As you set goals and think about what really is important in life, you will naturally find your priorities stay at the top of your list and the irrelevancies drop off. 1. Helps to manage your weight. 3. Combats some serious illnesses e.g. heart disease. 4. Reduces depression and anxiety. 6. Increases bone density which is critical in later life. 8. Enhances stamina in the workplace and in sport performance. In the industrialized world literally tens of millions of people suffer from illnesses and disabilities that can be eliminated through regular exercise. 1. Strengthens your immune system. 2. Prevents and treats disease. 3. Leads to higher energy levels. 4. Helps to manage your weight. 6. Promotes a longer life. 7. Improves your skin, hair, teeth, nails i.e. your looks! 8. Reduces mood swings and increases a feeling of wellbeing. 9. Increases the ability to focus and concentrate. Your body can only be as healthy as the fuel you give it to run on. Use the internet or visit a nutritionist for specific advice on diet and nutrition. Exercising regularly and eating healthily are an investment in your lifestyle and a gift you can give yourself. We are blessed with the ability to exercise and eat healthily – it is a crime to avoid it. Be disciplined, make time and make it a priority. You will never regret it.